George Fazio’s reputation as a master of the game was earned on the PGA Tour in the 30’s and 40’s. He paid his dues to the sport at some of the nation’s finest courses, including famed Pine Valley in New Jersey. George Fazio’s enduring gift to the game lies at the heart of Port St Lucie’s fabled PGA Village. 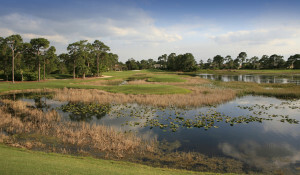 George and nephew Jim, in 1984 created the stunning accomplishment of design originally named “The Reserve Golf & Country Club.” The course and facilities underwent a multimillion dollar renovation and expansion, and is widely regarded as one of the finest golf venues in Florida. In a deserved tribute, the club was renamed “The Legacy” upon George’s passing to commemorate both the man’s passion for golf and this exceptional example of course design. $45.00 per player includes Cart, Greens Fees, Range Balls and Tax. Valid May through October. Tee Times available 3 days in advance.